Lintorf is a quarter in the northern part of the city Ratingen in North-Rhine-Westphalian (Germany); city in the northwestern part of Berg - about 12 km northeast of Duesseldorf. Thank you. 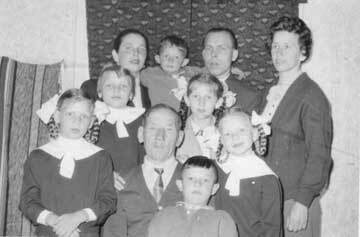 After the Americans came to Kapellen in 1945, mum and dad were taken temprarily to Anrath. From there they first went to the Dormagen camp (which was mainly Polish) for a short while and then to Lintorf - where they stayed from 1946 to 1947. From there they went to Seedorf in about 1948 before being processed for emigration to Australia at Fallinbostel in 1948. They left for Australia from Naples in 1949, arriving in Melbourne a month later. From there they were taken to Bonegilla - but because mum had a baby girl (my sister and was pregnant with me) she went to Cowra for a few weeks as the facilities for mothers was better there. They both finally came to Canberra in 1948. Do you know if there are any photos of the camps at Dormagen, Lintorf and Seedorf which are from that era?? Sadly your site, although very rich in information and more than an interesting read, was not shining any light on my families' exploits. They were at Lintorf which is proving a bugger to find anything about, period. 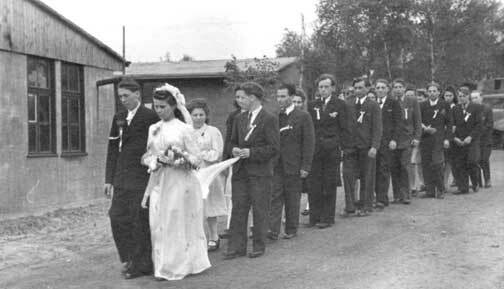 Attached is a picture of a wedding in Lintorf. I see my dad in it but I see no other I recognise -- date circa 1946. They left Lintorf in 47' as a couple (my mother and father) to UK. The lower picture is my dad's brother's family, found in Poland by Red Cross. We think after war circa 1955. Your site moved me and my contribution is of little value compared to your site and the emotional response it triggered.